Total porosity (n) is the capacity of an aquifer to store water so that expressed by ratio in percent of the volume of void space to the total volume of sediment or rock total volume. 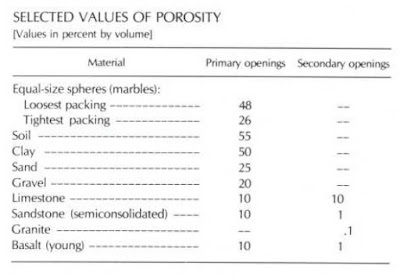 Generally, total porosity is expressed as a percentage. 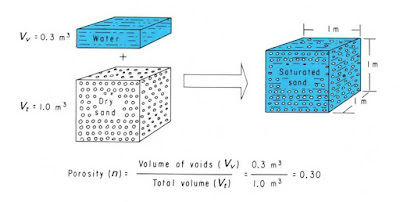 The voids are not necessarily interconnected and the water is not always free to flow within the rock: total porosity is a necessary condition for water flow, but it is not the only one. Two types of porosity can be distinguished, depending on the geological nature of the aquifer. Microporosity (also primary in oil industry or interstitial porosity) refers to the intrinsic porosity of the rocks, while macroporosity (fracture or secondary porosity) refers to porosity induced by fissures, fractures or karstic developments of consolidated rocks. Certain aquifers, such as some sandstones or carbonated rocks, have both interstitial and fracture porosity simultaneously. porosity (for “porous”) of materials is a quantitative measurement of the opening or pore space between grains. Effective porosity is always less than total porosity. 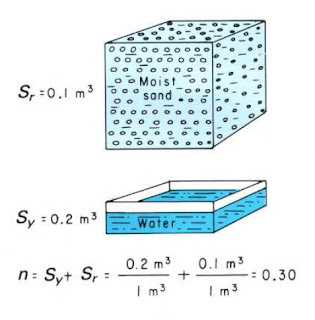 In general, unconsolidated sediments such as gravels, sands, silts and clays, which are composed of angular and rounded particles, have larger porosities than indurated, consolidated sediments such as sandstone and limestone.Crystalline igneous and metamorphic rocks have especially low porosities because the pores are merely within the intercrystal surfaces. Conversely, formations rich in platy clay minerals with very fine grain size can achieve high porosity values. Heath, Ralph C., 1983, Basic ground-water hydrology: U.S . Geological Survey Water-Supply Paper 2220, p 7. Kevin M. Hiscock, 2005, Hydrogeology: Principle and Practice, University of East Anglia, UK, Chapter 2. Zekâi Sen., 1995, Applied Hydrogeology for Scientist and Engineers, Lewis Publication, Chapter 4, P 70-72.